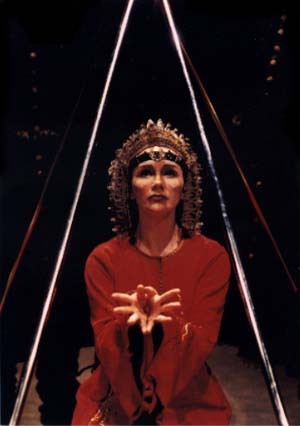 QOTN 1.5 MB wav Christina has been working professionally as a coloratura soprano since 1990 when she made her debut at Folkoperan in Stockholm with the role Olympia in Tales of Hoffmann. 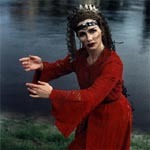 She was awarded a diploma from the Friends of the Folkopera for this role in 1991. Her career has also taken her to Germany where she has sung Olympia in Detmold and Philine in Lübeck. Christina made her Lucia debut with Dorset opera in England 1993, a role that she also came to sing at Malmö Musikteater in 1996. In 1996 Christina sang the role Queen of the Night at the Royal Opera in Stockholm, a role she also sang in a quite different setting in Karlstad at Värmlands Musikteater the year before. Bel canto has become Christinas favourite style, and she welcomed the opportunity to sing Elvira in I Puritani, by Bellini, with Södertäljeoperan in 1998. If you click the blue "wav" links along the way, you will be able to hear short examples from a few different occasions. Follow the arrow for more pictures.